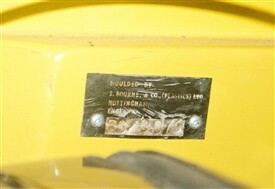 BELOW: The body plate on this car reads "Moulded by S. Bourne & Co., (Plastics) Ltd, Nottingham, England"
Bourne Plastics Ltd. was based at Netherfield and, later, Langar, and in the 1960s became the original manufacturer of glassfibre reinforced plastic (GRP) for the top-end sports car, the Lotus Elan 1500. 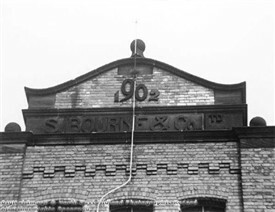 The company of S. Bourne & Co. was based at the Britannia Works on Victoria Street (built 1902) in Netherfield, east of Nottingham. They began as cotton spinners, but with falling demand in that market, had changed their focus to experimenting in the relatively new field of industrial plastics. In 1957 S. Bourne & Co. (Plastics) Ltd. was founded as a subsidiary company with new plant being installed for the processing of acrylic fibres and the moulding of glassfibre reinforced plastics for a wide range of industries. They became particularly noted in the manufacture of boat hulls, an early success being with the Bourne 35 cruiser and GP14 class racing dinghy. 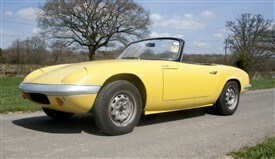 In 1962 Bourne Plastics won a £100,000 contract to supply GRP bodies for the new Lotus Elan 1500 sports car. 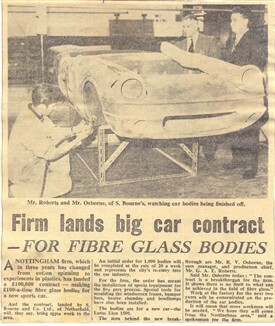 This was seen as a breakthrough for the company and, remarked the Nottingham Evening Post, “represent[ed] the city’s re-entry into the car industry”. Special tools and moulding equipment were installed at the Netherfield factory to achieve the five part body-forming process. Bournes went on to make the first 250-300 bodies before production was transferred in-house to Lotus cars in 1964. In 1967 Bourne Plastics Ltd moved to new premises on the Lenton Lane industrial estate in Nottingham and continued to expand their output of boat hulls. At their height they produced no fewer than 16 G.R.P. dinghy hulls as well as making hulls for Richmond Marine’s highly successful skipper dinghies of which 800 were made and sold in the first year. In 1971, having outgrown the Lenton lane premises, they moved again to the village of Langar to the south east of Nottingham where a new 30,000sq ft. factory was created from a hangar on the former Langar airfield. Here, boat hull manufacture was further expanded to a point where, at their production height, they were making 3,000 units a year. In the early 1970s Bournes once again entered to the car body-building world again with a new type of low-consumption, congestion-beating city car named the ‘Tici’. In 1973, with the world oil crisis fresh in everyone’s mind, the Tichy was promoted as a city runabout, ideal for commuting, or even for use as a golf buggy! 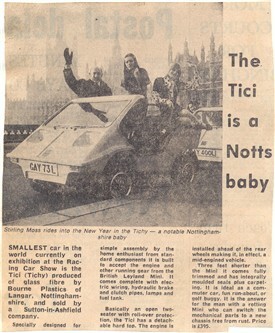 The Tici was specially designed for simple assembly by the kit-car market, being built from standard components. It employed the engine and running gear of a British Leyland Mini, although at just 89inches long, it was shorter than a standard 1970s Mini; At the time, the 'Tici' was claimed at the time to be the smallest car in the world. In design, the Tici was essentially an open two-seater (with roll bar) and detachable GRP hard top. One notable feature was that the engine was mounted ahead of the rear wheels, making it in effect a mid-engined vehicle. Bourne Plastics of Langar ceased trading in November 1977 with the loss of 100 jobs. This page was added by Website Administrator on 26/03/2013. Although Bourne's did mould the bodies, the company which made them was, I think, based in Loughborough - Tici Sales Ltd, however, was still in notts, actually on Mansfield Road in Sutton-in-Ashfield. Tommy Carr founded Asfield autos.in the 60s, had a large showroom,and car lot on Mansfield road Sutton in Ashfield, maybe 500 cars for sale parked nose to tail and just a few inches apart, each car had lists of all tommys current stock tucked under the wiper blades for customers to brows,cars listed by price from most expensive ( usually in the showroom) to the cheapest bangers kept around the back side of the lot, the Tici city body's were stacked on their rear ends in the part of the showroom overlooking the cheaper cars and this floor space was later the home of two caraboats. My dad brought several vehicle from Tommy over the 60s&70s,and in my early 20s I almost brought a VW beetle one time,(I was only browsing but ) Tommy gave me the hard sell, forced me/allowed me to take it home to try, on a hand shake? , in fact it was way beyond my price range at the time, but I took it , brought it back a few hours later, haha those were the days, never asked for an address, insurance or anything, but I'm guessing he remembered me going over the years with my dad.As a teen in the late 60s Always wanted a Tici or a bond bug, never got either.